This CD rocks. Ms. Denise gives you twelve dynamite songs to tap your foot, bob your head and clap your hands. The blues feel oozes from her. She does a magnificent job on the covers especially of Jimmy Reed's "Shame, Shame, Shame," and Willie Dixon's "I Got What It Takes and "Rooster Blues." But the song that really did in my soul was "If You Leave Me," written by Ms. Denise. I have listened to this track at least twenty-five times (yes that's 25) and still want to hear it again. It's just one of them songs that get inside you and you feel the passion and pain. This is a song I can hear being done by some great singers past and present, Koko Taylor, Etta James, Aretha and Janis Joplin, to name a few. It's got that good old blues/gospel feel that makes one want to "rent a tile." Slow drag is written all over it. Catherine Denise on this song more than any other dispels the myth someone so young can't sing the blues. It's rich. Whoever arranged this particular track outdid him or herself. The guitar of Denise is soulful and powerful. Her vocals tear at your heartstrings. The keyboards of Mark Goodwin take you to church or the juke joint which ever you decide. The bass of Tommy Shannon is heart stopping. And the slow tempo kept by Chris Layton creates the pain. GET THIS CD IF FOR NO OTHER REASON THAN THIS TRACK. Her covers would make the masters smile. She takes Jimmy Reed's loping style and ups the tempo a little yet this does nothing to detract from this song. As a matter of fact, there is a heightened enjoyment to it. Her licks on this one are very reminiscent of Reed himself. Listening one can see her fingers running up and down the neck. She plays masterfully getting your feet going, your head bobbing and makes you want to dance. "I Got What It Takes" is masterfully done. She feels the music and it shows. When she says, "I got what it takes to make a good man deny his name," she makes you believe it. She brings a jump feel to "Rooster Blues." This song like "Shame, Shame, Shame," are fancy footwork dancing songs. She makes one want to get up and dance, dance, dance. This debut CD tells you that great and wonderful things are destined in her future. She can play a lot of notes but they mean something. This is not a technique CD but a labor of love. 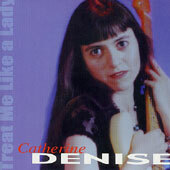 To the blues world I have only one thing to say, LOOK OUT CATHERINE DENISE IS COMING AT YOU. Her passion is pronounced. It gets in your face and stays there. If you want blues then listen to "Treat Me Like A Lady," and be treated to some of the best new blues I've heard in ages. To Ms. Denise all I can say is keep on strummin.' The blues is alive, well and in good hands with Catherine Denise strutting her stuff and play with the fire exhibited on this album. This review is copyright © 2002 by Lujira Cooper, and Blues On Stage at: www.mnblues.com, all rights reserved. Copy, duplication or download prohibited without written permission.